Healings Forever: Energy Healing Lamp - Awesome Healing Instrument ! Energy Healing Lamp - Awesome Healing Instrument ! "We were introduced to a brass energy healing lamp as an energy healing instrument during Reiki Trainings at Reiki Healing Foundation. We have made extensive use of camphor healing lamp & found it to be very effective. It is a simple & highly recommended energy healing device for everyone." Since time immemorial, spiritual practices involved lighting of various types of lamps & candles. Fire & light are synonyms of high energy, often used for healing too. Here is a lamp that is genie when it comes to healing. This lamp is widely used in Energy Healing & Feng-Shui Practices. Ceramic, metals and terracotta are the most common materials used for making the lamp. 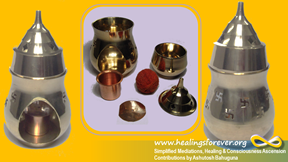 'Brass Camphor Lamp' can be used as a 'healing' as well as an 'gauging instrument' in Energy Healing. Upper Container: is usually filled with water and some pieces of camphor are immersed in the container. A few drop of Aromatic Essential oils can also be added instead of camphor, for using the lamp as an aroma diffuser. Lower Container: is used to place a lamp which heats the base of the upper container. The container is large enough to light the lamp for 5-6 hours. Support for Wick: is usually there is a spring attached to the container for lamp. I have modified the lamp and placed a plate over the container instead of the spring, to support the wick. Lamp lights up for a longer period and makes the cleaning of the equipment easier. Any thin metal plate with a small hole supporting the wick can be used if this plate gets wears out after prolonged usage. Wick can be easily made out cotton or coarse cotton threads. Hand-woven coarse cotton threads are easily available in religious stores by name of ‘Kaleva’, ‘Moli’, ‘Naley Ka Dhagaa’ etc). Oils: Sesame oil is preferred, though any oil can be used for the lamp. Keep healing affirmations & pictures readily available. Preferable placement location south-west area of the house. In case of healing rooms or certain areas in building, it can be placed at the location. Place the lamp in a safe place. Keep lamp preferably away from curtains, walkways and wood. Instruct family member to be aware and careful with the lamp. Avoid placing lamp in vicinity of unwell individuals to avoid restlessness in case of unpleasant smell. Wash (and wipe ) all Components, as required required. Place a few pieces of camphor in upper container & fill it with water. Cover it with the lid. Place the lamp in lower container. Place the lower container over written affirmations & photograhps or any other article to used if used. Wait for two minutes for initial soot reduce. Place the container in between you hands while placing it & program your intention for healing. Programming will direct the healing for psecific purpose. Lighting up the lamp wiithout any programming will heal the location and occupants off the place wherever it is utilised. “I invoke the light of the divine within. Light is my guide. Divine energy flows through me and protects me. Rotate one hand over the lamp counterclockwise 3, 7, 11 or 21 times for amplifyiing the intention of de-programming & purification. Remove all blockages and negative energies so that ‘[Accomplished state of Healing as in Afffirmations]’. It is Done ! It is Done ! It is Done !.Rotate one hand over the lamp clockwise 3, 7, 11 or 21 times for amplifyiing the intention of healing programming. Note: The phrases and language used is for guidance. Use language and words that appeals most to you. Reiki practitioners can use symbols for programming. Step 1: Power symbol for clearing negative energy from healing. Anticlockwise rotation of hand three or seven times for de-programming & purification. Step 2: Power symbol for programming with intention and rotate hand clockwise three, seven, eleven or 21 times for intensifying intention of healing. Note : if you want to use Master Symbol in step number 2, follow the complete procedure of the same. Wait for the flame of lamp to extinush on its own. It mayy take upto 8 to 10 hours for the container oil to be consumned. Do not distueb the lamp when it is in use. - Negative energy encountered during the healing is indicated by soot accumulated at the base of the upperr container. - when the energy is conducive and positive no soot is deposited. The base at times shines as it has been polished at times. - Overall progress and effectiveness of healing or measures taken for improving a situation can be monitored by programming the lamp and monitoring the amount of soot dpeosited. - Re-light the lamp only after cleaning off the previously deposited soot.